We’ve all been there – or for a lot of us, are still there. Budgeting. Budgeting might sound like a buzz-kill, but it shouldn’t be. With the right strategies in place, your food budget- and healthy lifestyle- shouldn’t take a hit. Couponing is hot these days, but in my experience, most coupons are for packaged, preservative-filled products that don’t exactly jive with a BerryRipe lifestyle. So I’ve put together a list of strategies to start you out on your mission: Eating Healthy on a Budget. This can mean a few different things. Firstly, check out the bulk section at your local supermarket or health food store. 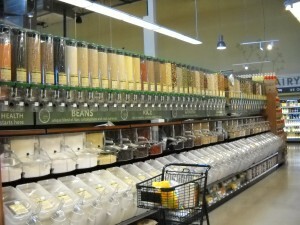 I love the bulk section at Whole Foods. Here you can find bins full of great dry products that are pantry essentials: quinoa, bulgur, cous cous, oatmeal, lentils, nuts, brown rice, flaxseed, and natural sweeteners. One of my favorite parts of the bulk section is the spices. A bottle of garam masala might cost you up to $8, but if you just need 1 tablespoon for a recipe, it can cost you pennies by scooping up your own baggiefrom bulk. Secondly, consider joining a wholesale company such as Costco. My boyfriend and I split a $75 yearlong membership. Not only do we get our gas cheaper, we can split products we buy at the warehouse. I won’t eat 14 apples before they go bad, but we can split the bag, get the apples cheaply, and know we won’t waste a penny. You know those instant oatmeal packets you buy out of convenience? The ones that always come out kind of runny and gross? Stop it! When you buy your oatmeal in bulk, buy some slivered almonds, flaxseed, dried fruit, and natural sweetener (I like sucanet). Pull out the measuring cups, throw it all in a baggie, and voila! You have homemade faux-Starbucks/McDonald’s oatmeal, at a fraction of the price. Think of how else you can do this in your home. Is it cheaper to buy a jar of marinara for $3.50, or whip up a big batch of your own marinara sauce. Portion out leftovers into half-cup servings, label them, and pop them in freezer. Make your own dressings for salad. Save major $$ and don’t pour preservatives on your nice fresh salad leaves. You most likely already have all of the ingredients you need! Chances are, the priciest items in your shopping cart are meat and seafood. Most of us grow up to believe that every meal revolves around meat, but it’s time to change that perception. It’s easy to save money on food! All of these items you can buy in bulk, and keep longer than most meat-based proteins in the fridge! If you want a sure-fire way to make sure you stick to your guns and not splurge, plan ahead. Everything! No one likes wasting food, and if you know you already have dinner at home just waiting for you to heat up, you are far less likely to pick up something unhealthy on the way home. My recommendation: Devote your Saturday or Sunday to meal planning, checking your mailers, shopping, and cooking for the week. I love looking at the pages I get in the mail that tells me what is going to be on special at my grocery store. That way I can plan around what I know will be on sale and what I want to do for the week. Consult the recipes you’ve found that have interested you, and pick four or five that have similar ingredients. Pick a staple that you can buy in bulk, and then cook up a big pot on Sunday without any extra seasonings. Then add flavor to portions throughout the week to keep things interesting. For example: veggie fajitas with brown rice one night, a veggie curry on brown rice another, a rice pudding for Friday night dessert. Make the most of the ingredients you buy. A red pepper costs 98 cents, but if you only need half a pepper for one recipe, find a way to use the rest that week, even if it means chopping it up for a snack. If you cook up all of your meals for the week on Sunday, it helps curb impulse spending, as well as the stress of after-work meal prep. You can freeze about anything. I’m a little obsessed with saving everything I can, but I know that every little bit helps. It really drives me crazy to only use a tablespoon of chipotle in adobo, when I know that there is about four tablespoons in a can. Each can costs about $1. So I label a baggie, pop it in the freezer, and voila! I’ve just saved 75 cents. And maybe that doesn’t sound like a lot, but think about all the ways you’ve let the little bits go. Not going to eat those last three bananas? Don’t let them rot! Chop them up into chunks, then baggie and freeze them. Later you can add them to smoothies, make fake-ice cream, or defrost for banana bread. When you’re checking your mailers and find great sales, buy double or even triple what you will eat for the week. Freeze the extras! There you have it friends- my first five strategies for how to eat healthy on a budget.